When was the last time you watched someone imagine things? I mean really see things that are truly not there and not be on their way to the crazy farm or LSD heaven. I watched this kid, probably not more than 9-years-old, put a plant pot over his head. It was tall and black with no holes it and I estimated 83 seconds before he passed out from lack of oxygen. 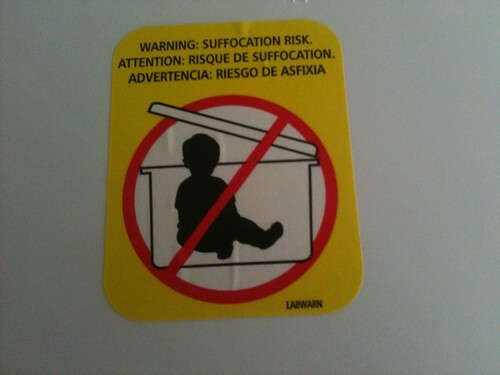 I have seen warning labels on everything from trash bags to the plastic slip my phone came in urging irresponsible adults not to let their dumb kids play with objects children can put on their heads and asphyxiate. You know who knows how imaginative kids can be? Lawyers. It was still refreshing to see kids running around outside playing with bikes and slightly dangerous things like plant pots. I’m sure they’ll be fine and I rather die from being lost in my own imaginative bliss than from being obese because I never leave my couch. Then I saw some girls wearing over-sized navy sweatshirts and mesh backpacks. They were embracing like Frodo and Sam when Frodo tried to leave Sam behind and continue his perilous journey to Mordor. I remember hugging my friends like that on Fridays because I knew I probably wouldn’t see them that weekend and I just didn’t know how my life would go on without my best friend around, even though I would likely spend the entire weekend on the phone with her. As I got closer to the end of the street the girls actually pulled apart and instead of a massive blob of black hair and eyeliner I saw three middle school students. One walked away from them and two walked towards me. The shortest one was smoking. I wondered why. I hate smoking and walking. I was starting to gather that I wouldn’t be seeing a lot of adult supervision on this block. It was around 4:30 p.m. It doesn’t look like a bad neighborhood. I saw an elderly couple sitting in their yard waiting for the sunset to shower the sky and bring a close to their long day. At least that is what I hoped they were doing. There were people everywhere. It reminded me of my neighborhood in Houston. Then I passed that house. You know the one that you’re not sure if it is still decorated from Halloween or if it just looks like a possessed shack of a house all the time. I stared at it and wanted to take a picture. ← How much do you love your iPhone and where did you get that case?